In the lead-up to the first round of voting in Brazil’s presidential elections, Chinese media reports offered varied perspectives on China-Brazil relations. Brazilian economist Marcos Troyjo was optimistic in a Xinhua interview about China’s proposed economic transformation and the new commercial opportunities that a growing Chinese market presents for Brazilian businesses (专访：2.0版中国”有助于提升中巴关系——访巴西学者马科斯·特洛伊若). Another Xinhua article warned of ongoing tension between the two countries, partly due to unresolved cultural differences (中国投资巴西谨防“有交易无交情“). Several news outlets monitored the political contest between major presidential candidates Dilma Rousseff, Aécio Neves, and Marina Silva, including Huanqiu (巴西举行大选电视辩论 总统候选人避敏感议题), which is strongly supportive of the Chinese government. One dispatch predicted that Brazil’s election results would affect the management of the country’s central bank and the development of its pre-salt oil reserves (巴西执政党被指为连任用“恐怖手段” 打击对手). Articles did not explain how election results might affect Chinese business interests in Brazil. Media coverage of Mexico in September detailed security issues. Quoting statistics originally published by Pemex, China Radio International reported that thieves across Mexico have drilled 2,471 illegal taps into state-owned pipelines this year alone, generating losses of at least $1.2 billion (墨西哥一段石油管道被挖 今年共损失12亿美元). Another article cited concerns over stowaways seeking to enter the United States by train (墨西哥将提高赴美边境火车速度 防止偷渡客攀爬). Most reports conveyed optimism about the region’s future and prospects for greater relations with China, however. Chinese media took note of diverse opportunities for further economic engagement with Latin America. Participants at the 8th China-LAC Business Summit in Changsha, Hunan, highlighted the potential for new investments in the region’s manufacturing, renewable energies, and agricultural industries, and suggested that Chinese companies partner more regularly with local firms (发掘拉美新机遇：制造业新能源最具潜力). 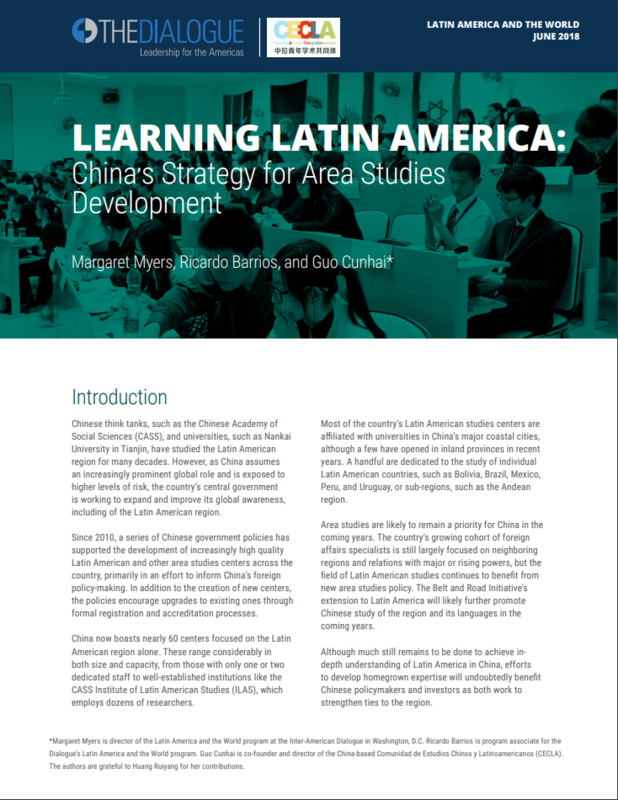 A Caixin report suggested that Chile’s deepening relationship with China could serve as a model for its neighbors in Latin America (智利农业部长：中智合作为拉美提供经验). Next Next post: Where is China’s Metals Industry Headed?